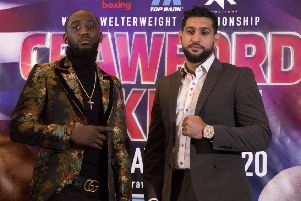 James Tennyson will be a interested spectator when Ireland’s Jono Carroll takes on IBF World Champion Tevin Farmer for his belt in Philadelphia on March 15. Belfast super-featherweight Tennyson will be backing Carroll after losing himself to Farmer in Boston last year in a brave bid to dethrone the American. Farmer and Carroll came face to face in a press conference in America this week and words were exchanged during the meetings - but Tennyson says it will be a good fight between the two super-featherweights. “Yes it will be a good clash and they were getting a bit excited at the press conference this week. And Tennyson will look to get back on track as he takes to the ring at the Ulster Hall on February 9 as he faces undefeated lightweight Garry Neale from England. And Tennyson knows he has to get back to winning ways as he looks to get back fighting for major titles. “I have to win at the Ulster Hall and then move on and have a big 2019. I have just become a dad so I am determined to do well for my family and myself. Also on the bill former IBF European Lightweight Champion Paul Hyland Jnr takes on Miroslav Serban. Tommy McCarthy closes in on a British title shot as he comes up against Jiri Svacina. Luke Wilton continues is comeback while Mathew Fitzsimons faces Alec Bazza. And Cathy McAleer looks to build towards a third world title in as many disciplines with a four round contest with the durable Sonia Klos of Poland. Tickets from www.ulsterhall.co.uk or from the boxers.